Small - $19.99 Only 4 left! Medium - $19.99 Large - $19.99 X-Large - $19.99 Only 1 left! We’ve all pretended our dog was talking in that deep gravely Darth Vader voice. “Puppy, I am your father.” Or “I find your lack of faith to be disturbing.” Fido doesn’t really look like the Dark Lord, but don’t worry, we have something to make him a little bit more…powerful. 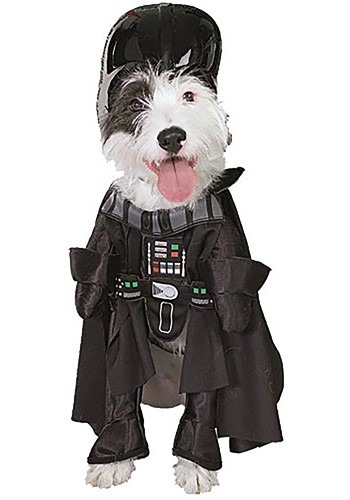 Putting this Darth Vader Dog Costume on Fido might not give him the power to use the force, but don’t think that he isn’t using subtle mind control on you already. You give him a treat when he looks at you a certain way. And that was without him looking like the Dark Lord. Now that he has the look down too…well we said the costume MIGHT not let him use the force. But then again, it just might. All we’re saying is don’t be surprised if he can now wield a lightsaber. Love this! Got this and the Ewok one for the puppy- the extra large is too small for my Irish Setter. Going to have to make it larger somehow. Slightly disappointed as it's hard to find costumes that actually fit the measurements given. Ewok medium barely fits my pug.